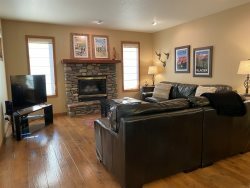 This Mountain Harbor home has a deeded boat slip which can be rented from the Homeowner's Association so you can fully enjoy the beauty of Whitefish Lake. Stunning views of Whitefish Lake from the large deck and master bedroom! 3 bedrooms, 3 bathrooms, 1 king, 2 queens and a pullout queen in the living room. Has a gas fireplace in the living room. Condo has portable air conditioning units in both of the upstairs bedrooms. Full lake view, boat slip and double garage. Mountain Harbor is a family friendly lodging choice for reunions and weddings. With around 20 condos of varied size in one small resort there's plenty for everyone. Mountain Harbor has it's own outdoor swimming Pool open for Summer and an outdoor community hot tub open for Summer and Winter / Ski Season. The Mountain Harbor beach is one of the best on Whitefish Lake with 405' of private lake access. Fire pit at the beach and a tennis court and basketball hoop are some other amenities to please all ages. *Pool & hot tub is open during Summer months. Hot tub is also open for Winter/Ski season. Friendly neighbors and staff, awesome location! MH114 is an excellent unit and very comfortable, the views of Whitefish Lake are fantastic. Thank you, we will be back!